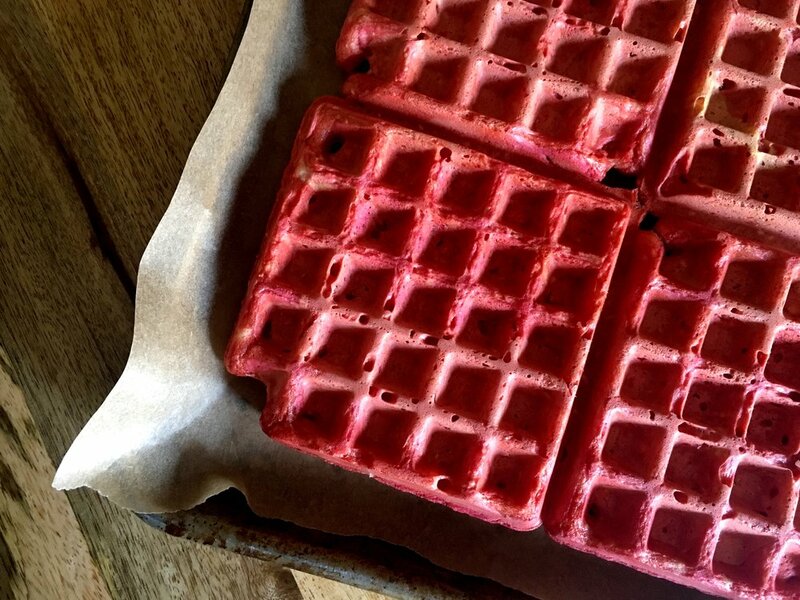 The waffling continues: Little Nettle requested purple waffles, so I roasted up a beet and puréed it with some frozen blueberries. The batter was an amazingly intense violet-purple. The waffles themselves a little less so after cooking, but still suitable for unicorn food. I served them with a roasted asparagus tofu Hollandaise, which I don’t have a picture of, but it was a very vibrant meal indeed. My sweetheart and Little Nettle got me a waffle maker last Christmas and I’ve been waffling ever since. I got Little Nettle her own copy of Unicorn Food, and these waffles are inspired by the Calico Beet Waffles - you can find the original recipe here. They’re citrusy and sweet and not too earthy; the neon beet color is phenomenal. Next time I might up the beet content, or add blueberries for an even deeper hue. To freeze, let the waffles cool and separate them, then place them in the freezer, separated by parchment paper. Make sure you lay them flat for easy storage later. You can pop straight in the toaster or defrost them in the microwave first. Or you can eat them as soon as you make them. What will I waffle next? Green spinach and spirulina waffles? There is not as large a library of food of the Inca as there is of food of the Aztec or Maya, at least not as has been translated into English that I could find - so I wound up getting a book in Spanish so I could read more about Inca foodways. My Spanish is unfortunately very rusty, so that means doing a quick scan through recipes is out of the question. That also means that by the time I have finished reading through a passage, it turns out I am trying to figure out how to make dried ground corn - which is much more of a project than a recipe! If you have a little bit of free time on your hands, perhaps you are up to it. I have typed out the instructions in both Spanish and my shaky English translation below. I won't tell you how long it took me to translate as it would just embarrass us all. Desgranar el choclo (maíz tierno) o el maíz seco. Hervir los granos durante corto tiempo hasta que estén medio crudos. Algunos hierven el choclo en mazorca. Extender los granos sobre que espacios cubiertos con paja o ichu durante varios días hasta que el grano se seque, se "chupe" hasta que llegue la mitad de su tamaño original. Una vez seco, el maíz se muele no muy fino y se cierne para que elimine el afrecho. De-grain the sweet corn or dry corn. Boil the grains for a short time until they are medium raw. Some boil the corn on the cob. Spread the grains over areas covered with straw or bunches of grass for several days until the grain is dry and has "sucked" to half its original size. Once dry the corn is ground very fine and any hanging bran is removed. The quantities are up to you! I assumed that "de-graining" the corn meant to simply remove it from the cob. This is incorrect! Desgranar is actually much more specific than I had thought, which makes sense. It refers to lifting out the kernels of corn from the cob by wiggling at the individual roots, one camino, or row, at a time. I don't really know what the difference between maíz tierno o maíz seco or sweet corn and dry corn is - or why there would be the same instructions for both. Perhaps they are just synonyms? I am also not sure why this particular kind of dried ground corn is not nixtamalized; when I look up chuchuqa or chochoca online most of the results I get refer to a kind of potato bread. However, it seems like some corn was simply secado al Sol: dried in the sun.